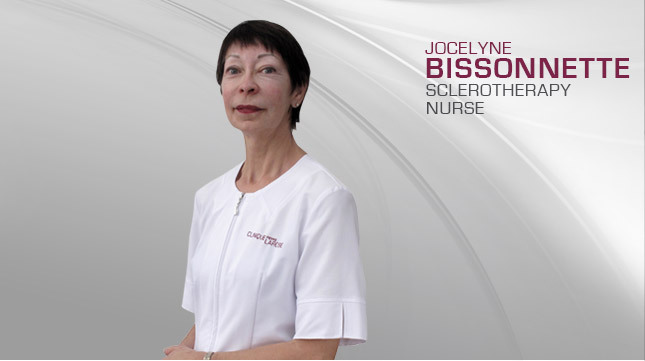 Jocelyne Bissonnette, who is a leading expert in sclerotherapy, joined Dr. Pierre Larose’s team in 2014. With close to 20 years of experience in nursing care, she brings a rich and diverse combination of knowledge and skill to the table, which makes her an undeniable asset to the clinic. Jocelyne began her career as a Research Nurse at Notre-Dame Hospital in Montréal, and moved on to become Nurse Team Leader and a Home Health Nurse for Centre Rouville in Marieville. She returned to the world of research in 2001, focusing on an endometriosis study for Procréa Bio Science, a fertility, research and development clinic in Montréal. From 2003 to 2006, she served as a Sclerotherapy Nurse working in esthetic medicine for Centre de Médecine & Chirurgie Esthétique (Longueuil and Granby). Her interest in the area of sclerotherapy led her to focus on this field at the Esthé Novo clinic in Saint-Lambert from 2007 to 2014.